You’ve likely heard things like this during a job interview, or maybe you’ve even said them yourself to a potential new employee. But are the statements actually true? At some companies they are, but for the most part, these statements are part of the lies we’ve collectively been telling ourselves and everyone around us. When these new employees actually start, they realize how untrue the statements were in the hiring process. Instead of an open office, they find red tape, bureaucracy, and partitions. Managers are hard to communicate with, and the other employees are disengaged and stand off-ish. It leads to a negative work environment and unhappy employees. After all, no one likes to be told one thing only to realize that it couldn’t be further from the truth. 1. Be honest. The first step is to stop telling the lies. Telling employees or potential employees one thing when they will clearly soon find out the truth is bound to catch up with you. You can’t keep talking about an amazing office culture that doesn’t exist because employees will soon catch on and are sure to realize that the culture isn’t what you promised. The easiest way to build trust is to be honest from the start. 2. Own your faults. Not every organization is perfect. You’ll gain much more respect from employees if you can own the things you need to improve instead of making excuses or lying about them. If you know your office layout is lacking, make a plan to fix it and acknowledge that there’s an issue. Being open can lead to an honest conversation about what needs to change. Humility as individuals and as an organization can go a long way. 3. Get others involved. The key to being transparent is to open your organization up to involvement from others. Share updates with employees and customers and invite them to give you feedback. Consider it an open window into your offices–there aren’t any secrets or lies, but rather ways to open up and talk to each other. 4. Be strategic. There’s not one way to be transparent, and what works for one organization might not work for another. Look at ways you can implement openness and honesty that match your culture and the needs of your employees. For some companies, that could be regular town hall sessions with the CEO, while other organizations could benefit from an open door policy. Make sure your transparency goals contribute to your overall growth and employee strategy. Telling the lies is part of the reason billions of people around the world are stuck in jobs where they don’t feel valued or appreciated. No one wants to end up in this situation, but it happens when people believe they’ll be working in a certain atmosphere but end up in something totally different. 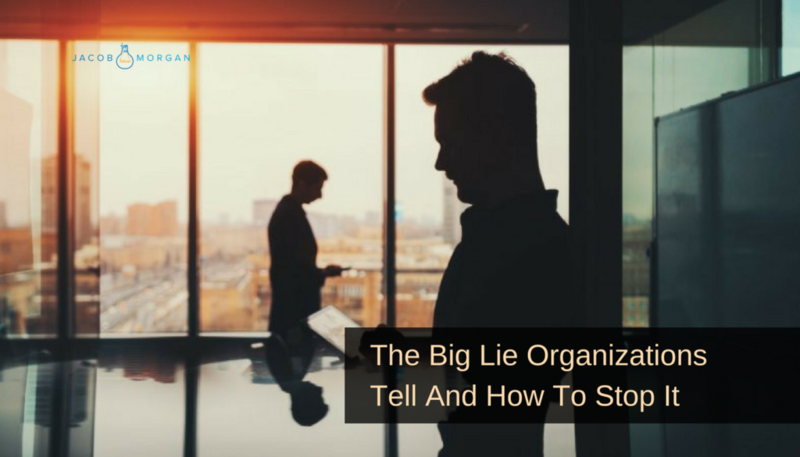 Let’s fight employee disengagement, stop telling lies, and turn to transparency–it will make a huge difference in our employees and organizations.Learn more by watching this video here.